An interview with historian Eric Kurlander about his book Hitler’s Monsters: A Supernatural History of the Third Reich. 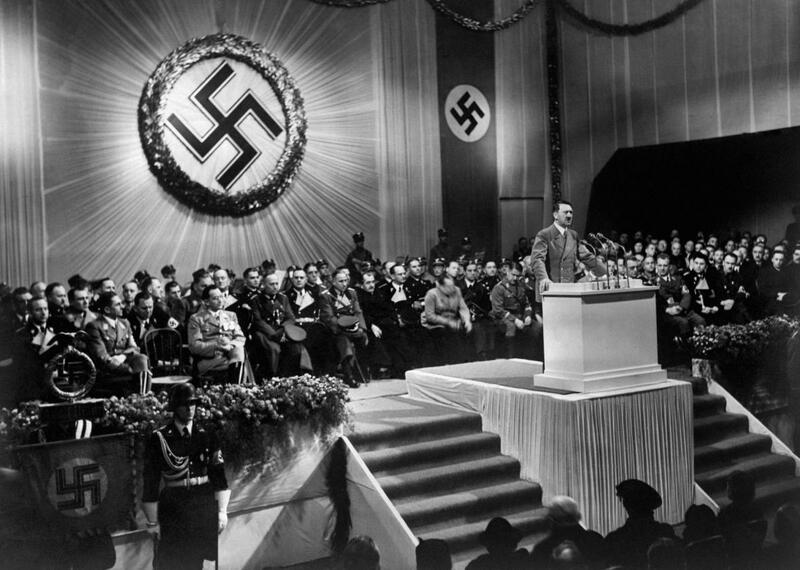 A picture dated 1939 shows Adolf Hitler giving a speech during a meeting with high-rank Nazi officials. But that doesn’t mean the Nazi relationship with this kind of fringey thinking is meaningless. Historian Eric Kurlander has recently written a book that takes Nazi occultism seriously: Hitler’s Monsters: A Supernatural History of the Third Reich. Grouping astrology, some practices in archaeology, history, and folklore, and out-there scientific theories together under the heading “the supernatural imaginary,” Kurlander writes about how the popularity of border thinking guided the Nazis in creating their own political reality in Germany. We spoke recently about World Ice Theory, the anti-Semitism inherent in Nazi critiques of mainstream science, and lessons from Nazi unreality for our own post-truth times. This conversation has been edited and condensed for clarity. Who participated in supernatural thinking in Germany in the ’20s, ’30s, and ’40s? Everyone? And do you think Nazis actually believed this stuff, or did they find it politically convenient? Educated urban liberal elites and Jewish intellectuals were the least likely to embrace any of this as authentic, or see it as anything other than a pathology of modernity that was particularly strong in Austria and Germany and needed to be dealt with. They could see people they otherwise respected finding some of it interesting, and worried about that response, but they were almost universally opposed to it. Why did so many Nazis, in particular, believe it or find it interesting or see it as potentially helpful in manipulating the population? Because they grew up during a flowering of supernatural thinking across Germany and Austria. So even the Nazis who were skeptical recognized it as a profound theme. You have both Hitler and Goebbels in the 1920s acknowledging that ‘folkish [völkisch]’ thinkers are the ones most likely to join the Nazi Party. Many of these people want to wander around “clothed in bearskins,” as Hitler put it in Mein Kampf, talking about mystical runes. Now Hitler and Goebbels said, “That’s not what our movement is about.” So some people say, “You see, Hitler wasn’t into that!” But my question is why didn’t Churchill or Roosevelt or France’s Prime Minister Leon Blum have to write things like that to their constituents repeatedly? It’s because [supernatural thinking] wasn’t so intrinsic to [their] movements. So to come back to France for a minute: In France, you don’t see the equivalent politicization and racialization of it. You have theosophy in Britain and America. But it’s a relatively harmless movement, where people get together in a drawing room and try to connect with spirits and write novels about Atlantis. But the concept of root races, which [H.P.] Blavatsky, the Russian progenitor of theosophy, talked about, never gets brought up as an actual basis for belief in “superior breeding” or race war among the liberal or conservative parties that run the government in Britain and America. It clearly is not influencing Roosevelt or Churchill’s view of social policy or foreign policy. But in Germany so many of the people who joined the Nazi Party or supported it are using language and ideas directly borrowed from these occult and border scientific doctrines. “Tschandals,” the lesser races, a Thule civilization. In the 1930s Hitler and [Heinrich] Himmler gave an honorary doctoral title to the living co-progenitor of World Ice Theory, or “Glacial Cosmogony” as they called it, Philip Fauth. They put him and Hans Robert Scultetus, who was trained as a meteorologist, in charge of a World Ice Division in ’35 or ’36 within the Ahnenerbe, Himmler’s giant Institute for Ancestral Research. The sole purpose of the division was to coordinate and propagate World Ice Theory as official Nazi doctrine. The really mainstream, well-known natural scientists—as far as I can tell, they were just ignored. So Himmler didn’t put them in jail or anything, he just wouldn’t give them the time of day when they wrote the letters. But if you were a person within the SS ambit, like this guy named Georg Hinzpeter, you were in trouble. All Hinzpeter said was, “You know, if we use what we’ve got in the last 30 years in terms of physics and geology, some calculations and claims that [co-progenitor of the theory Hans] Hörbiger made 40 years ago—not his fault, that was the 1890s—don’t quite hold up, and maybe we should rethink these premises.” And that was when Himmler and Scultetus and this other guy, Edmund Kiss, who wrote fantasy novels about Atlantis—not even a scientist!—they all agreed: “You know what? We’ve got a protocol [The Pyrmont Protocol] now. Anyone practicing World Ice Theory now has to subscribe to its basic tenets”—almost like a bible. “And if you don’t, you will not be allowed to publish, at least not with the imprimatur of anything in the government, and you will not get any funding.” In 1939, World Ice Theory became a very rigid kind of orthodoxy. As in many other areas, the Third Reich was not a totalitarian regime in all ways. They weren’t going to start locking up otherwise brilliant “Aryan” scientists who paid their taxes and joined the military because they found this theory laughable. But they weren’t going to change what they thought or redistribute funding in a more rational way, either. What other theories, beside World Ice Theory, did the regime adhere to in that way? Well, the entire apparatus of race theory was founded at least as much on ideas drawn from Indo-Aryan religion, Nordic mythology and occult or border-scientific doctrines as it was on modern biology or eugenics. Eugenics as practiced in most of the West was limited by the fact that those people wanted to be accepted by mainstream biology. So eugenics was a pseudoscience, not a border science. It did come out of mainstream genetics and biology, it just made claims that were out of all proportion with scientific capacity or reality at the time. And when that proved as destructive as it was, both scientifically and ideologically [after World War II], it got reined back in. In the Nazi case, it’s the opposite. While they make certain nods to the eugenics movement and say “Oh, this brilliant Swedish or British eugenicist was very inspiring,” when you look at how they argue about race, with the Jews being monstrous and the Slavs “sub-human,” while Indian, Japanese, and perhaps even Persian and Arab civilizations are deemed at least partially Indo-Aryan, it’s all this stuff that’s wrapped up with ariosophy, theosophy, anthroposophy—these major occult doctrines that were prominent in Austria and Germany. It had so little to do with actual empirical science, or even pseudoscience practiced elsewhere during the first half of the 20th century, that it opened the way for all these fantastical policies. To what degree was anti-mainstream-science feeling within the Nazi Party also anti-Semitic? I wouldn’t say they were “anti-science.” The Nazis simply thought that there are new sciences, new ways of doing things that traditional scientists hadn’t accepted, in part because they’d been corrupted by Jewish leftist materialists who don’t understand the mystical parts of life. Because the Jews, they insist, are these soulless, self-interested, evil people who just can’t get the organicist connection between soul and body—and all these other ideas that völkisch and esoteric thinkers, and many Nazis, embraced. You make the argument that, near the end of the war, miraculous thinking was a strategic and military detriment to the Nazi war effort. What happened to this kind of thinking through the lead-up to the defeat and after the defeat? My impression is that the supernatural imaginary, and the Nazi dismissal of mainstream science in favor of border science, impacted their ability, financially and logistically, to maximize military resources. I give examples, like the rocket program and death rays and other things that the SS was trying to develop, and Hitler’s own aversion to nuclear technology. I haven’t quantified it, and the effect may have only been marginal, and there’s a lot of research left to be done here. Maybe [supernatural thinking] only undermined the Nazi ability to maximize whatever it was they needed at any given time—more bombers, more fighters—by 10 or 20 percent, and they would have lost anyway. But clearly there was an impact there. We happen to have a period in Austria and Germany, where for various reasons, the intrinsic popularity of certain occult ideas and border scientific doctrines, of alternative religions, Nordic mythology, and German folklore, punctuated by crises, like World War I and the Great Depression, made the supernatural imaginary much more widespread, public, political, and dangerous as a reservoir of policy, than it would have been otherwise or was in other countries at that time. After the war, now that Germany was defeated [these kinds of supernatural thinking] became receded from the realm of policy, becoming a mostly privatized form of entertainment. No longer were there research institutes, supported by Himmler or Hitler, sponsoring parapsychology, dowsing, or World Ice Theory. With the collapse of Goebbels’ Propaganda Ministry no major German political leaders were promoting astrology as a means of propaganda or threatening collaborators with retribution from Nazi “werewolves.” And that for me is important. So people are still interested in the supernatural today! They’re playing video games and reading Harry Potter, but most recognize the difference between supernatural thinking and empirical science; between fantasy and policy. I think Germans since 1945 have become more allergic to these kinds of faith-based, organicist, racist, völkisch ways of thinking, precisely because of that experience from the 1890s and to the 1940s. It doesn’t go away, but it becomes privatized and held at arms’ length. One of the things that makes liberals, lefties, centrists feel so frustrated in encountering an administration that is anti-reality, is the feeling that nothing you will say can make a difference. Is there anything that opponents of Nazis in Germany did that Americans can take a note or a lesson from, in terms of intervening against the supernatural imaginary taking hold of the national mind? Let’s say one-quarter or one-third of [people in] all modern industrialized societies are sympathetic to fascism. They may claim they believe in democracy and elections and some kind of individual rights, but when it comes down to it, they’ll sacrifice those to have this kind of national organic folk community that fits their vision of their country. And they’ll give up all sorts of rights and kick out foreigners. You want to be arguing against people who have that point of view, but you also want to make sure you aren’t alienating the more rational actors, who recognize that this is dangerous and would only side with the fascist group if they’re alienated from whatever the putative left might be. It means not exaggerating or demonizing certain things that are really legitimate points of view, even if you disagree with them, and then being careful to explain your terms when you want to identify fascist, or racist, or supernaturalist thinking. It’s not an easy process, because once [supernatural thinking] has been unleashed, and we’ve been resorting to faith-based responses to complex problems it for years, it’s very hard to turn around and suddenly say, “Global warming is happening. It’s just a question of how bad it is, and what we can do about it.” Or “the world is not 5,000 years old, the world is billions of years old. We need to accept science and evolution.” It’s hard for conservatives now to say that, much less liberals, and still get elected. When it comes to some of these fundamental premises on which we base our political and social reality, all educated people, all citizens, regardless of politics, [should be] agreeing and pushing back. And I don’t think we’re there yet.